Rome: New election deadly for AS Roma stadium? June’s municipal elections in Rome already shook the city’s scene. The council was taken by Movimento 5 Stelle (5 Star Movement or simply M5S) with a stable majority of 29 out of 48 posts. The mayoral election also went to M5S’s representative, Virginia Raggi. Both Raggi herself and her party’s officials managed to deliver some stunning quotes. The new mayor spoke against Rome’s 2024 Olympics bid, while in the council strong opposition to the AS Roma stadium is clearly heard. It’s noted surprisingly often in Italian press that the new mayor supports Lazio, which some try to use to explain her opposition to the new AS Roma stadium in Tor di Valle. Is it really a massacre? But as far as Roma is concerned, it’s primarily Paolo Berdini whose words made waves. The newly-elected city councilor for planning spoke out strongly against the planed stadium during an interview for Radio Radicale. “I will use every means possible to prevent this massacre and protect the interests of the city. Roma have available the Olympico and Flaminio, that should be valued.”, said Berdini. Later the fresh councilor changed his tone while speaking to ANSA news agency. “In any case, it’s still too early to evaluate, we will have plenty of time to study the project closely”, he claimed, confirming that he’s against the project in its current form. “Plenty of time” is surely not the attitude at AS Roma as the club only recently managed to file the complete stadium dossier, following years of preparation and consultation with previous public authorities. Berdini’s statements were met with criticism beyond the Roma camp. Marcel Vulpis, director at SportEconomy.it, emphasizes that too much work has been carried out over the past 2-3 years to discard it so hastily, before even taking office. Debate pending on Tor di Valle? While Berdini spoke clearly against the planned development, today the upcoming city council leader Marcello de Vito (also M5S) had a more conciliatory statement. 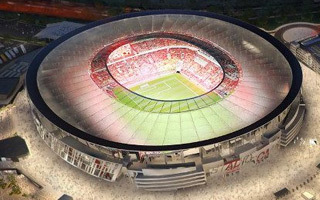 “We will evaluate whether to bring it to the council floor, we'll make the necessary checks,” he said, stressing that the M5S are not against a new stadium, but “ask it to be with respect to the laws”. Therefore it seems further discussion on the development will follow. “Of course, a debate where the stadium is 14% of the project isn't a debate on the stadium”, de Vito said. Indeed, the 52,000+ football stadium is only a piece of Rome’s largest leisure-commercial complex in history. Only a fourth of the €1.7 billion ($1.88bn) budget is earmarked for the stadium itself, much more will be spent on three skyscrapers and extensive retail developments around, as well as AS Roma’s training complex. The recent heated debate is bad news for the project, which has already been delayed several times. Initially groundbreaking was expected in 2014, then 2015 and now in late 2016 or 2017. The stadium itself should be ready within over 2 years, while surrounding developments would be phased.